“The wages of sin is death,” the apostle Paul writes in Romans 6:23. These words were horrifyingly instantiated this past Friday when a terrorist gunman opened fire on two mosques in Christchurch, New Zealand, killing 50. The crime was, in every way, monstrous. Minutes before he went on his rampage, he emailed top government officials a rambling and incoherent manifesto, outlining his ardent white nationalistic beliefs. He then strapped on a helmet camera so he could livestream his attack on social media. Finally, he shot many worshipers at these mosques, which included several children, at point blank range as they cowered in corners. If anyone ever doubted the dastardly death that sin – including philosophical sin like white nationalism – can bring, now would be the time to become a true believer in the devastations of depravity. Near the end of the book of Genesis, we read of a man named Jacob and his twelve sons, the favorite of whom is Joseph. Joseph’s brothers, Genesis 37:4 says, “hated him” because of his status as his father’s favorite son. Their hatred eventually spawned a plot among the brothers to kill their kinsman. And they would have, were it not for a last-second intercession by one of the brothers, Judah, who decided it would be more financially advantageous if, instead of killing Joseph, they sold him into slavery (Genesis 37:26-27). White nationalism explicitly tramples on Jesus’ command. It not only fails to love its enemies, it actually creates enemies where there need be none and becomes an enemy to those who do not fit its arbitrarily contrived ethnic and philosophical strictures. It trades the foundational and universal sanctity of life for a hackneyed and exclusionary solidarity of race. Blessedly, love did manage to rise up and break through when hatred was spraying a hail of bullets into two mosques in Christchurch. 48-year-old Abdul Aziz was at the second of the mosques. He was there with his four children to pray. When the terrorist began firing in the parking lot of the mosque, rather than running away, Mr. Aziz ran into the lot with the only thing he could find – a credit card machine. After firing off many rounds, the terrorist returned to his vehicle to grab a second weapon, and Mr. Aziz hurled the credit card machine at him. The terrorist then fired off another series of rounds at Mr. Aziz, who managed to protect himself by ducking between cars. When the terrorist returned to his vehicle yet again to grab yet another weapon, Mr. Aziz found one of the guns he had dropped and, after realizing it was empty, threw it at the windshield of the terrorist’s car. The windshield shattered. The terrorist was spooked. He sped off. And many lives were saved. Mr. Aziz explained, in an interview with The New York Times, “I was prepared to give my life to save another life.” That’s love. And it stopped hate dead when hate was trying to speed death. Christianity teaches that there was another man – a perfect man, who was also God – who was prepared to give His life to save other lives. His name was Jesus. And He not only was prepared to die. He did die. And He not only saved lives by His death. He bought for us eternal life with His death. “The wages of sin is death,” the apostle Paul writes in Romans 6:23. But he continues: “But the gift of God is eternal life in Christ Jesus our Lord.” In Jesus’ death, love killed hate. May this be our confidence and our conviction as we mourn the tragic losses in Christchurch. Entry filed under: Current Trends. Tags: Christchurch, Christianity, Gunman, Hatred, Hope, Islam, Love, Mass Shooting, Mosque, Muslim, New Zealand, Terrorism. 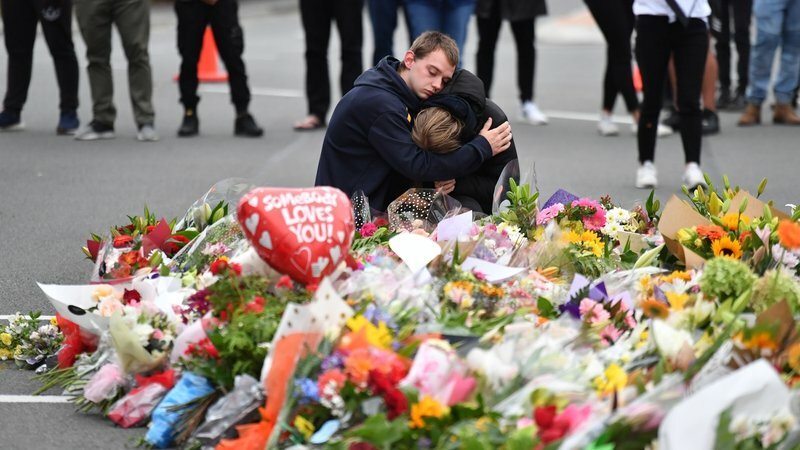 Thank you so much for this blog about the New Zealand shootings. It’s so helpful to know how to respond to this as a Christian and at the same time be able to witness of the love of our Savior. Don’t stop writing, Pastor Zach!! Profound. Reminds me of a Coretta Scott King quote ”Hate is too great to burden to bear; it injures the hater more than the hated”.